DAZ 3D is pleased to announce the next public version of the DAZ Install Manager - version 1.1.0.15! The 1.1.0.15 version is a maintenance release and fixes or makes improvements to several issues discovered since the 1.1.0.7 General Release. More detail on specific fixes/changes/improvements can be found in the Change Log, which can be viewed online within the Documentation Center portion of our site. All new downloads of DAZ Install Manager will be of this version. *Note: 15) A pending update to DAZ Studio (4.6.3.36+) is required to begin using this feature. just got the update notification. And started the update from the DIM notification. 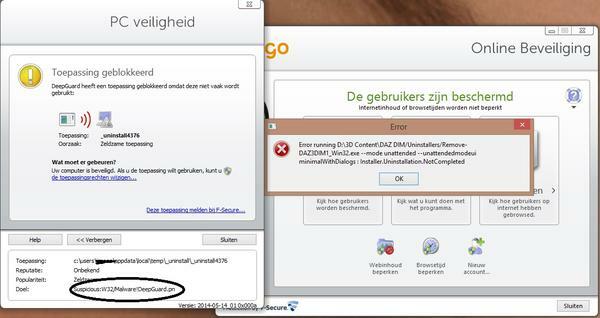 However my virusscanner reported a problem with the uninstall of the old version and stopped the update proces. This is the first time i have this with a DIM update, ,maybe a false positief from F-secure.....at least i hope so. Just did a manually download and installation of the new version. that did not give any warnings and updated correct to the new version. OMG, I'm totally going to try and set up an IP-restricted firewalled Postgres instance on a dedicated host that I run on the Internet and try this. Once, you know, the associated DAZ Studio version has been released. I know that like...97.3% of users won't ever use that feature, but I'm definitely thrilled to try and have a single centralized CMS for the machines I run at home and work (whose files are already synchronized, but CMSes always had issues)! And one that I might be able to query myself...Muahahahahhaahahaha! Thank you for the update. I just noticed it was updated this evening. Got it installed. Faster than the last release. I love that! OK so when can we expect the new version of DS then?? I'm really liking the new visual items, like the cursor as you scroll down the list, and the more distinct color of an item that's selected. I agree B. It's just better and better and makes all this downloading so much easier I have to say. Soon I'll have faster connection too. I'm switching providers. AT&T U-Verse is out and Sonic is in. They are very local, Menlo Park, where I work. They provide service to Redwood City where I live and have lots and lots of happy clients. I'll have about 3 times faster connectivity for less than AT&T offers. Can't beat that. Can't wait! :-) Weeks end hopefully! Better and better? Well yes installs are fast and seamless. That I give. Making my day easy? Never. You try to category a full pro bundle all at one time. I'm too stupid to install stuff one at a time for that. Besides I'dd never once get all my content installed at once if I did not dump install. I'm pretty sure that DIM is the only reason I have everything installed at once. I do not ever remember being fully up to date before DIM. Didn't they add 'drag and drop categorization' just for that? Yep but I do same item to many places. That my big issue. ...but I do same item to many places. That my big issue. ...another DIM update, and just like the last two times after it ran then closed, when I opened it again, the desktop shortcut was deleted. This time though it looked like all the DIM the folders in the C:/Programme Files (X86) folder were deleted without the new version being installed. The only log files I could find in app data/Roaming/Daz3D/InstallManager were from the previous installation (1.1.0.7). Something is seriously broken here and it is beginning to get really ridiculous. Does anyone know what would keep causing this to occur?. The only time I've seen this was with an NVIDIA/Intel dual graphic card, but they fixed that about 6 months ago. ...don't have that setup, just the standard Intel graphics and an nVidia fermi GPU. I've been getting updates and patches from both Intel and nVidia and installing them to avoid any conflicts so most likely have whatever that fix is. As I mentioned I never used to have this issue until the update back in March (1.0.1.115). Since then I have been forced to manually DL and install each time which has probably only made the situation worse with the auto update routine. Last time it just removed some of the DIM components, this time everything (save for in the ApplicationData/Roaming folder) was wiped out. The only other manual installer for the DIM I have is from February of 2013 which is when I first installed it on the new system. So this says somewhere between then and March of this year, something with the auto update broke as there have been a number of updates in that time which ran perfectly fine. What date is the file C:\Windows\SysWOW64\nvinit.dll? what on earth are these and will I need them? I still don't understand what it does and how it is different tho....technical language and me don't go together well. It's a different database server which is much more reliable and faster than the Valentina CMS. It's less liable to corruption. DAZ BHowell... I have a question please. Can the CMS database be imported into a SQL Server using some ETL (Extraction, Transform and Load) Tool? I have to say that i like my files to download in archived files and keep them for later when i just unpack them and use. The DIM does this already. The 'unpacking and install' is optional and separate from the downloading. Is it crashing and shutting down or is the file just not installing? It is crashing and shutting down. There was an error but I did not save it. I turned off the computer for a while and restarted it. I am trying to recreate the error now.